Poison Ivy is an allergic reaction to the Poison Ivy plant. The leaves, berries, stem, and root of this plant contain a sticky sap called toxicodendrol. This oil is also found in poison oak and poison sumac plants. Exposure to these plants may lead to an allergic reaction resulting in the development of itchy rashes, blisters and other symptoms of allergic contact dermatitis. Poison Ivy plants generally grow as vines or shrubs. The leaves of the plant are smooth-edged and are usually found in groups of three, five or seven. The appearance of the plant may vary from one region to another. The allergic reaction spreads to the areas where the sap comes in contact with the skin. If contacted on clothes or objects, the sap should be removed as soon as possible as it can stay active for months and the re-exposure can cause the allergic reaction again. The intensity of the symptoms depends on the amount of exposure to this sticky sap and the affected individual level of sensitivity. These symptoms may last for a period of one to four weeks. The most important aspect of the treatment for Poison Ivy is to control the intense itching to avoid further skin infections. Though, many over the counter medicines are available for this purpose, still they can not beat the safety and effectiveness of the natural home remedies for Poison Ivy treatment. As mentioned above, Poison Ivy is caused by contact with the sap of the Poison Ivy plant. It could be spread through any part of the plant. Clothes, objects and even pets that have been exposed to the plant may spread the sap through contact. Besides, exposure to the smoke of the burning plant and even dead Poison Ivy plants may trigger this allergic reaction. A Poison Ivy rash usually starts within a couple of days after the exposure to the sap of the plant. Then, lines of itchy rashes or blisters begin to appear on the skin. The affected area is characterized by redness, skin irritation, severe itching and inflammation. The allergic reaction may also cause headache and fever. It should be noted that the rashes on the skin spread due to the spread of the invisible sap and not due to the spread of the fluid present in the blisters. Therefore, it is not a contagious disease. • Rubbing a solution prepared from boiling Jewelweed in water is one of the most successful natural home remedies for Poison Ivy. • Putting aloe vera juice on the affected area is the most trusted natural remedy used in healing the skin irritation caused by this disease. • Applying the milky juice extracted from milkweed on the affected area serves as a therapeutic home remedy to cure Poison Ivy. • Rubbing the inner side of a banana peel on the affected area is highly beneficial in the home treatment of Poison Ivy. • Crush the leaves of black nightshade plant and mix some milk or cream in it. Applying this mixture is regarded as one of the most valuable natural home remedies for Poison Ivy. • Applying garlic treated mustard oil and massaging with this oil is effective in treating Poison Ivy in a natural way. • Applying a mixture of apple cider vinegar, white vinegar and salt is one of the most popular home remedies for Poison Ivy. • Take some oatmeal and boil it in water. Apply this mixture on the Poison Ivy affected area to get rid of the problem. Oatmeal baths are also recommended to relieve Poison Ivy itch. • A poultice prepared from one of tablespoon salt, preferably rock salt, one tablespoon of baking soda, one tablespoon of oatmeal and about one or two tablespoons of vinegar. This is one of the most popular home remedies for Poison Ivy. • Applying rhubarb herb helps to provide instant relief from this allergy. 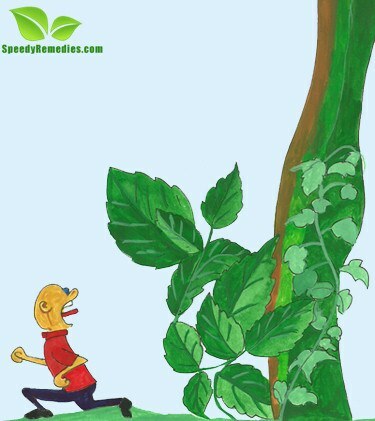 • Prepare and apply a mixture from fresh jalapenos and apple cider vinegar as a natural remdy for Poison Ivy rash. • Add some sweet fern leaves in water and boil the solution. Applying this solution on the affected area is highly beneficial natural cure for Poison Ivy related skin irritation. • Simply washing the area with water and then rubbing some salt over is a widely used home remedy that helps in dealing with Poison Ivy. • Goldenseal, burdock and yellow dock herbs have been found to be extremely useful in controlling this ailment. Regular intake of vitamin C rich foods is helpful in getting rid of this ailment. Bioflavonoid, beta carotene, zinc and calcium are also beneficial in dealing with Poison Ivy. They help to reduce the itching and swelling and facilitate the process of repairing damaged tissues. Therefore, try to include foods rich in these vitamins and minerals to aid in faster recovery.